If you are ready to step up the family feast this year, get ready to be soaked up to your elbows in salty brine. This Smoked Ham is where it is at. Taking on a whole ham is a feat. A victory that won’t be achieved by many. Committing to hunting out a fresh skin on ham, which will most likely have to be special ordered from your local butcher, a week long brine and following through while a smoked ham recipe is one for the culinary bucket list. This time of year markets have freezer cases spilling over with spiral sliced delights that make the Easter feast easy. And there is absolutely nothing wrong with grabbing one of those babies and nibbling to your hearts content. 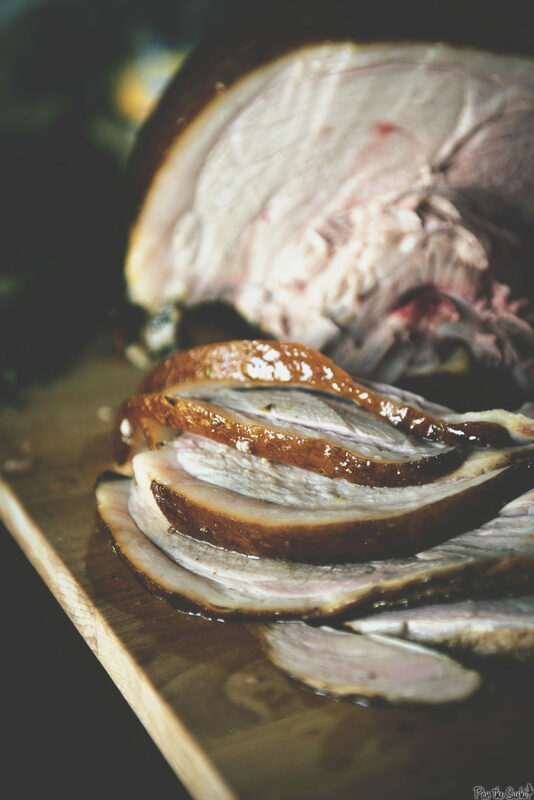 But if you are ready to step up the family feast this year, if you are willing to get soaked up to your elbows in salty brine, if you are man enough to heavy this 20 pound beast from smoker to the table, then get excited. 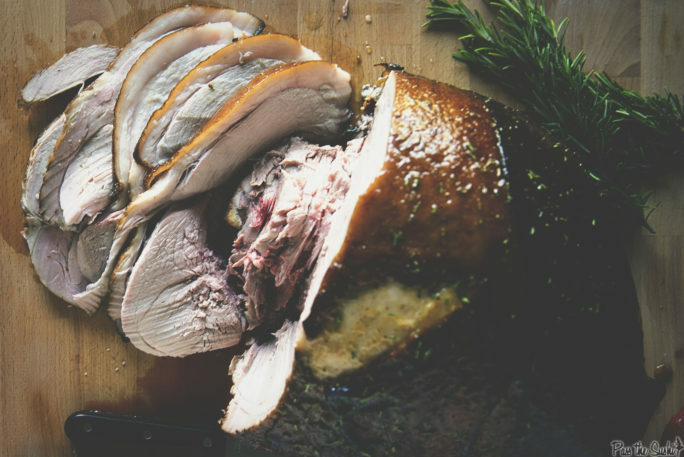 Traditionally, meats were smoked as a means to preserve them. Modern home refrigeration has only been around since 1913. Before that, people needed a way to keep food from spoiling before it could be eaten. Smoking meat may have started as early as the Stone Age with the discovery of fire. Throughout the centuries, smoking and salting meat for future use has been refined, and today we keep up the practice largely due to the incomparable flavors it produces. I’m about to take this feast up a notch. If you’ve tried my Smoked Ham recipe, or any other recipe on GirlCarnivore.com please don’t forget to rate the recipe and let me know where you found it in the comments below. I get inspired by your feedback and comments! You can also FOLLOW ME on Instagram @girlcarnivore as well as on Twitter and Facebook. Don’t be afraid to use that smoker. Here are some more things to try once you’ve finished gnawing on that ham bone! 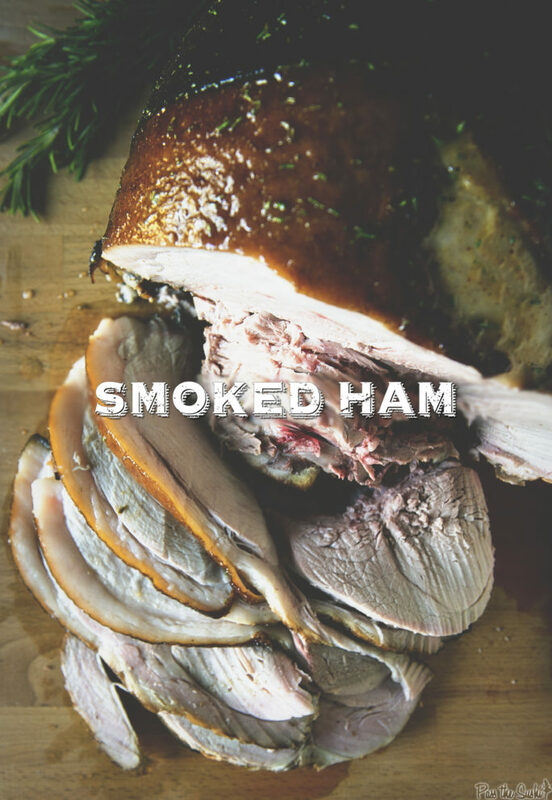 If you’ve tried my Smoked Ham Recipe or any other recipe on GirlCarnivore.com please don’t forget to rate the recipe and let me know where you found it in the comments below. I get inspired by your feedback and comments! You can also FOLLOW ME on Instagram @girlcarnivore as well as on Twitter and Facebook. Going into this recipe you need to make sure you have everything lined up. Time, space, and patience – and lots of it – for at least 8 days. A large cooler that you can keep cold works great. I used a spare fridge, removed the shelves and placed a cleaned cooler in it to brine the ham. A huge roasting pan. The ham requires an over night air dry. Make sure you have a pan big enough to hold it. A smoker. Make sure your smoker can handle the size of a 20 pound am. If not, scale the recipe as needed. In a large pot, bring the water, salt, brown sugar, garlic, mustard seeds, coriander seeds, and bay leaves to a simmer. Whisk until the salt and sugar are completely dissolved. Remove from heat and let cool completely. When the brining liquid has cooled, find a large container, big enough to hold your ham. Submerge the ham in the brining liquid and weigh down the ham to keep submerged, if needed. Brine in the refrigerator for 7 days, turning once in a while. Remove the ham from the liquid and discard the brine. 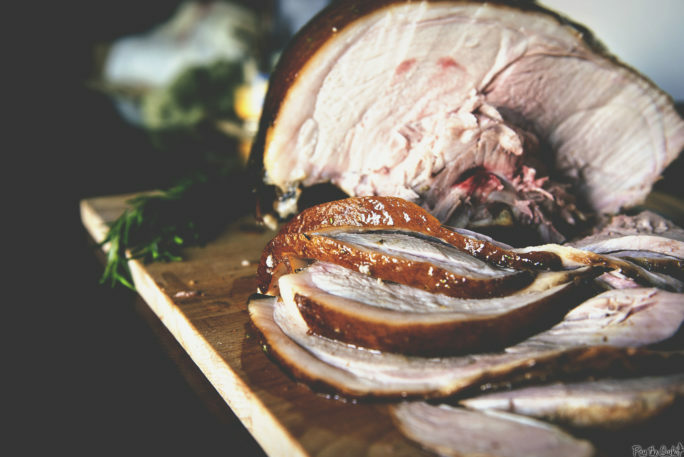 Place the ham on a wire rack set inside a large roasting pan and place in the refrigerator, uncovered, overnight to air dry. Prep your smoker for a temp of 200 degrees. Place the ham in the smoker and smoke for 4 hours. Add new wood chips after 2 hours. Meanwhile, whisk the honey, Dijon, and rosemary together in a bowl. Brush over the ham. Close the smoker and smoke for another 3 to 4 hours. Check the temp on the ham. You are looking for 165 degrees F.
Remove the ham from the smoker and allow to cool. Brush with the remaining glaze. You are my hero, Kita. This looks absolutely amazing. You’re right too; that is one for the bucket list. I’m tres jealous.